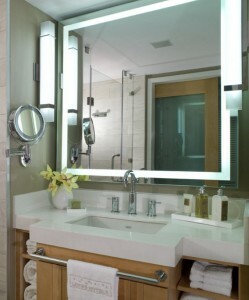 Take the time to make yourself more comfortable with a luxurious new bathroom. Now that the new year is here, you may be looking for ways to rejuvenate your home. Two simple ways to do this involve remodeling your kitchen or bathroom. But the bathroom should be a place of refuge, especially if your kitchen is where everyone in the family gathers on a regular basis. It’s even harder to keep up with the hustle of everyday life in the winter when all you want to do is hibernate. Take the time to make yourself more comfortable with a luxurious new bathroom. Winter mornings can be cold and dreary, so the first step towards making your bathroom more comfortable is to combat that feeling. Start by making your bathroom brighter. That’s why you need some better lighting. Think about the windows in your bathroom – they might not be the best fit for the space that you’re in. Awning windows and sliding windows can make a huge difference. Plus, changing the glass in the windows or switching out the mirrors with new ones can help brighten up the bathroom as well. Next, consider the colors you want to use in your redone bathroom. Natural-themed colors are the best for creating a soothing environment. Green, blue, and tan are all great choices, especially if you’re in the mood to get away to the shore; a beachy-themed bathroom is a fantastic way to get over the winter doldrums. Just be sure to use some wood in the bathroom too. After you’ve done that, pick out some new linens. After all, your old towels will eventually wear out. They’ll start to show holes and will feel scratchy. Replace them with new ones. Also, choose a new rug or mat to catch the water after you get out of the shower or tub, and put a nice comfy robe before you get into bed. For best results, install a towel warmer. That way, you can beat the chill with a nice hot towel to help you relax. One final suggestion we have for you is to engage all of your senses. Play some music over a wireless speaker you keep in your bathroom. Dim the lights with a dimmer or turn off the lights and use some candles instead. Using essential oils and bath salts may seem trendy, but they also go a long way towards helping you calm down and recharge after another long day. This entry was posted on Wednesday, January 16th, 2019 at 10:16 am. Both comments and pings are currently closed.